Users should take care in selecting the appropriate syringe type for your syringe pump. Below are some common features of a syringe like its size, plunger, and tubing that users should consider when making a selection. There are three features of a syringe barrel that should be evaluated: the outer diameter, the inner diameter, and the volume. The outer diameter (OD) represents the thickness of the syringe barrel. This value ultimately determines whether the syringe will physically fit on the syringe pump. Most syringe pump manufacturers indicate the allowable syringe sizes for a syringe pump by the volume of the syringe. This approach often works because most syringes of a certain volume have a similar OD, but the OD of some specialty syringes (gastight, steel, etc.) are drastically different from their more common counterparts. Users should be aware of the actual OD of their syringes’ size as well as the maximum OD allowed by the syringe pump. Some syringes may have uneven or tapered barrels causing the syringe to not lie horizontally in the syringe block holder. If the plunger is not horizontal and the plunger cap is not flush against the pusher block, then that results in the pusher block pushing horizontally against a non-horizontal plunger. This can cause inaccurate flow rates and potential damage to any syringe type. The inner diameter (ID) represents the thickness of the cavity inside the barrel where the fluid is stored. This value is extremely important because it needs to be known to be able to set accurate flow rates on the syringe pump. The flow rate of a syringe pump is based on the linear distance the syringe plunger needs to travel to transfer a specific volume in a set amount of time. Because the inner cavity of the syringe barrel is a cylinder, the linear distance the plunger needs to travel can be determined based on the volume equation for a cylinder. The following represents the cylinder volume equation that has been rearranged to calculate the linear distance the plunger travels to transfer a specific volume. where l is the linear distance the plunger travels in cm, V is the volume in mL, and d is the diameter in mm. Luckily, on a Chemyx syringe pump, this type of calculation is done for the user. Just enter the inner diameter of the syringe into the syringe pump interface or load a syringe from our built-in syringe library, and the pump determines how far and fast to push the syringe plunger. The flow rate limits for a Chemyx syringe pump are determined based on the linear distance limits. The minimum flow rate is dependent upon the step resolution of the stepper motor of the syringe pump. The maximum flow rate is determined by the fastest linear speed the pusher block can travel. Both of these limits are primarily dependent on the type of stepper motor. Users should choose a syringe with a volume/ID that puts the linear movement near the middle of these two limits. The syringe volume should have enough volume to satisfy the user’s application. However, the user should be careful to select a syringe that does not excessively exceed their volume requirements. Syringes have approximately an 1% error in volume for glass syringes (about 5% error for plastic syringes). This means that users should select the smallest syringe possible for their application that allows. For example, using a 50-mL syringe to transfer 1 mL of fluid would have about a 0.5 mL error in volume, which would be problematic because the actual volume dispensed could range from 0.5 to 1.5 mL. The size of the syringe plunger cap must be considered for applications that require syringe withdrawal. During withdrawal, the syringe cap must be secured by a bracket on the pusher block of the syringe pump. The brackets on Chemyx syringe pumps accommodate a wide variety of syringe sizes with different plunger cap sizes. In some rare cases, very small syringes or very large syringes may not have plunger caps that will fit within the bracket. The size of the flange is important for the stability of the syringe on the syringe pump. The flange should be large enough that when it is pressed against the syringe holder block, it will help prevent the syringe from moving forward when the plunger is being pushed. On syringe pumps that can withdraw, the flange should be large enough that the flange bracket can clamp on to it. 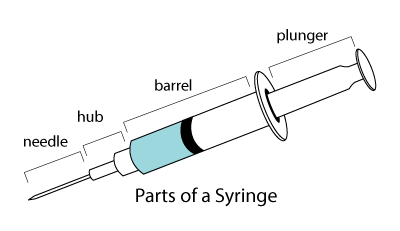 The needle or tubing system connected to the tip/termination of the syringe can often restrict the flow of the fluid which may cause enough back pressure to result in the syringe pump stalling. To minimize the amount of back pressure, a larger inner diameter and/or shorter length tubing should be utilized when possible. The type of material used for the syringe can have an effect on the user’s application as well as the use of the syringe pump. Plastic syringes are an inexpensive, disposable option that typically comes sterile out of the box. Typically, these syringes come with either a full plastic plunger tip or a rubber plunger tip. The rubber plunger syringe tip type is the better option to minimize fluids leaking past the plunger. However, plastic syringes do have a couple of significant drawbacks. Plastic syringe plungers and barrels have some flex under pressure which leads to volume inaccuracies as high as 5%. Additionally, rubber-tipped plungers tend to absorb some organic solvents such as DMSO. Glass syringes are the most common type of syringe used with a syringe pump. Glass syringes are reusable, compatible with most applications, and more accurate than most syringe types. The plunger of a glass syringe can be made of ground glass, glass with a Teflon syringe tip type, metal-only, or metal with a Teflon tip. A ground glass plunger is typically the cheapest option, but it can suffer from leakage of fluid past the plunger leading to volume inaccuracies. Additionally, some chemicals may cause the ground glass to fuse rendering the syringe useless. The other types of syringe plungers lead to syringes that are the most accurate with minimal leakage (some are even air-tight). The decision to use one type over the other depends on the compatibility of the fluid with the syringe plunger type. The biggest downside for these syringes is the cost, which is significantly greater than most syringes. Stainless steel syringes are the most durable syringe available. These syringes are primarily used for high-pressure dosing applications that would cause a glass or plastic syringe to burst. While having an accuracy similar to glass syringes, they do not typically come in sizes much smaller than 5 mL, which minimizes their application for smaller scale use. Stainless steel syringes are more expensive and not as easy to use as other syringes because they are not transparent, making loading and removing air bubbles more challenging.